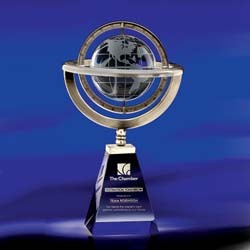 Our exclusive Omni Crystal Globe Award is so heavy it requires two hands for lifting. Featuring antique silver-plated metal and solid optic crystal, when it comes to detail it's no lightweight either. The etched globe rotates freely on its axis for an added touch. Note that for safety this item is packed as two separate pieces and requires minimal assembly. Setup and Crystal Engraving included!